It can be tough traveling with a big dog if you don't have a car. This summer I was lucky enough to get a lift with some friends down to Palaikastro, in the east of Crete. 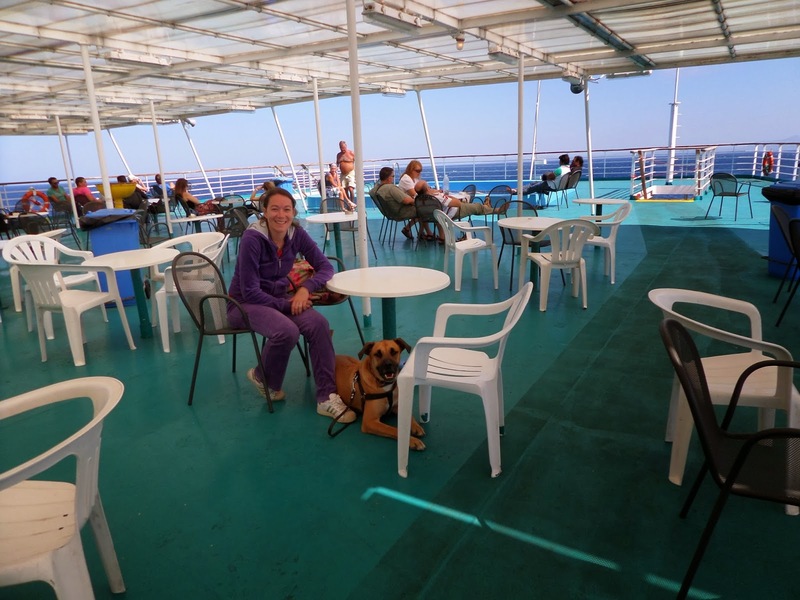 When it came to getting back to Heraklion, however, I wasn't sure how I was going to manage. Small dogs are permitted on the KTEL buses, as long as they are in carrier cases and you have the documentation with you to show they have had inoculations. With large dogs, it's a different story. I have heard horror stories about dogs carried in the luggage compartment of buses (extreme heat and lack of oxygen), so this is just not an option. Some car hire companies do permit animals in the cars, or you could hire a taxi/van (at some expense) and transport your dog in a carrier. I will admit that the timetables section is a bit frustrating. When I was looking, in September, there were two ferries per week, Wednesdays and Sundays. The tickets costs just 15E, which is actually cheaper than the bus, and takes about the same amount of time. 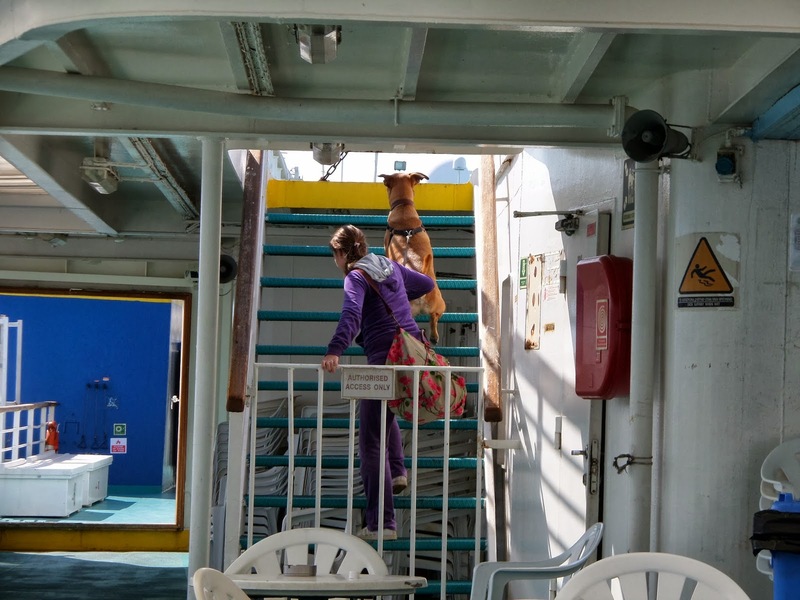 Plus, you can sit on deck with your dog!! We were traveling in September, so there were not too many people. 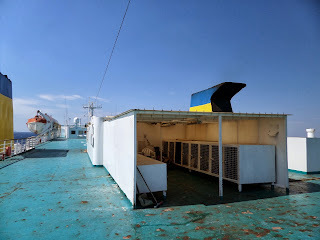 However, it's a big ferry, I'm sure even in summer you would find a corner to settle in with your dog. I think Sage was a bit unnerved with the noise and the movement of the ferry in the beginning. She didn't seem very comfortable, and I had to coax her up hundreds of stairs to reach the upper deck. We got to the deck and found a shady place to sit out of the way of the other passengers. Luckily, I found an old friend from our days of dog walking in the Heraklion parks. 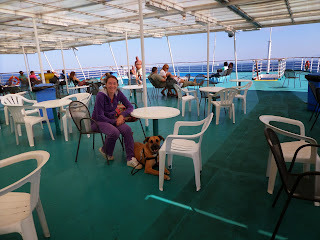 She was traveling from Rhodes with her dog Guinness, so Sage and Guinness kept each other company while I went inside. As Guinness had a longer journey, he did spend some time up in the kennels provided, when necessary, then came out to sit on the deck whenever possible. I went to have a look at the kennels. They were pretty clean, and are covered so the dogs are protected from sun and wind. There were a lot of dogs there though, some of whom didn't sound very happy to be there. I also learnt that during the busiest times, in the height of summer, the cages can get a bit dirty. If you know you will have to put your dog in the kennel, it may be a good idea to have some wet wipes, and an old blanket so your dog has some familiar smells around. It can also get a bit chilly up on deck, even in the summer. For a short trip, if you are traveling alone (I mean, just you and your dog), I'd just advise that you are better prepared than I was (go to the loo first, and buy a sandwich before you board, for example). This is probably second nature to dog owners, but do allow some time for your dog to pee before boarding. There is a mop and water to clean up, but especially if it's a short trip, it just makes it easier if you don't have to think about this. You know your dog. If you think your dog will bark and annoy other passengers, you may get less nasty looks if you put your dog in the kennels. Unless it is very windy, I think this is a great way to travel with your dog, as you can sit together, walk around and stretch your legs, and comfort them if they are anxious travellers. Thank you so much for this post! 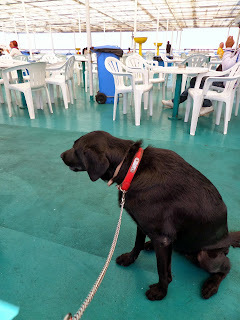 We have to travel with our dog from Venice to Patras on Anek ferries. 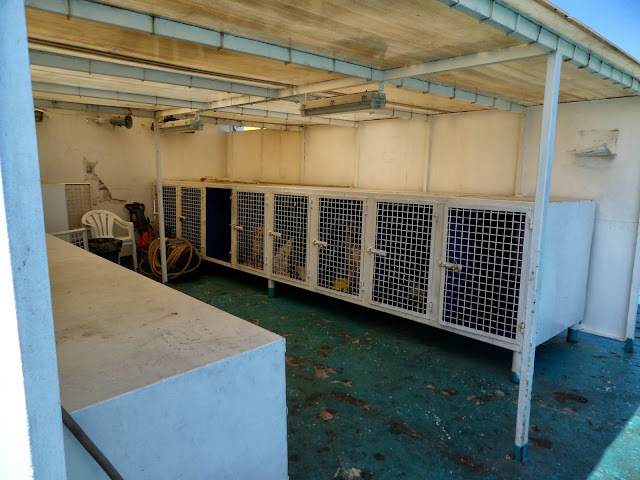 I was concerned about the kennels but now that I've seen an example I know what to expect. Cheers!